Remember when cars were interesting? Remember fins, and chrome and giant grilles and wide white-sidewall tires? Remember when cars weren’t just initials and numbers and hyphens? Remember two-tone cars? I do, and if you’re of a certain age you’ll recall hardtop wagons that were almost as sleek and exciting as regular hardtops, like the 1957 Buick Century. Well, BoS-Models has re-created a beautiful Century wagon, the Caballero Estate Wagon in 1/18 scale. The resin sealed body review model was a stunning metallic light blue over cream. The Caballero hardtop wagon was only made for two years, 1957 and 1958 with only 14,642 sold during that period, so it’s a rarity in the vintage car world. Today, some sell at auction for more than $100,000. No wonder, the car is a knockout. It’s special because of its beautiful lines, and lack of a B-pillar, as in any hardtop, gives it a clean, sleek look. 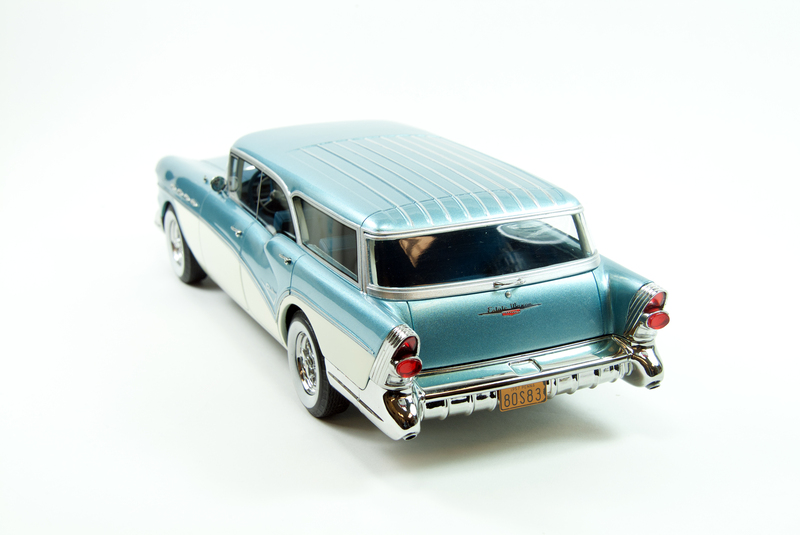 Its two-tone paint job enhanced by the sweeps of chrome along its sides and around its windows gave it a streamlined appearance compared to the standard boxy wagon. The Century Caballero also was special because of its power. It packed a 364-cubic-inch Nailhead V8 that was rated at 300 horsepower. Reportedly the car, which weighed a hefty 4,670 lbs., would muscle from 0-60 mph in 11.5 seconds with a top speed of 116 mph – more than respectable for a 1950s wagon. Caballero was a big beast too. 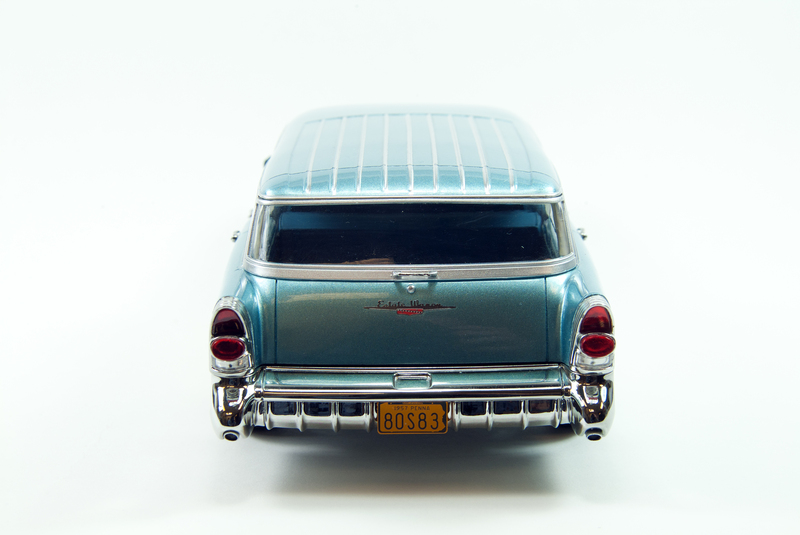 The rear-drive wagon rode on a 122-inch wheelbase and was 208.4 inches long, picture somewhere between a current Chevrolet Tahoe and Suburban. 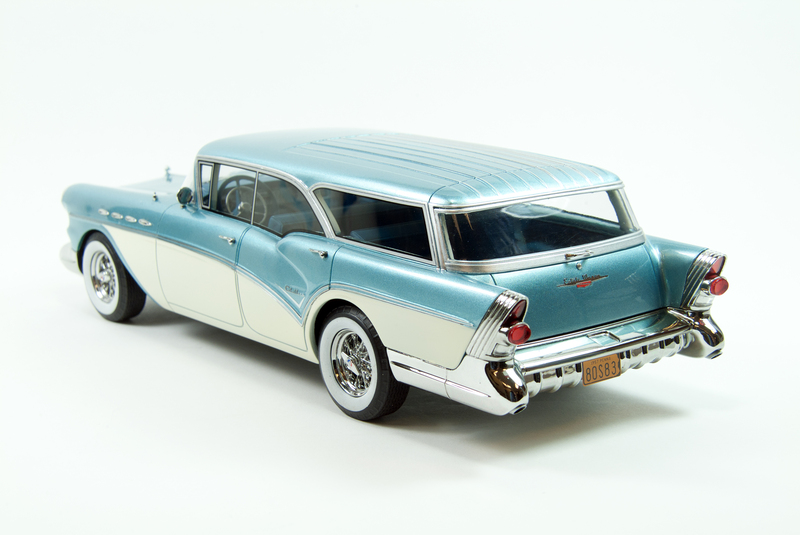 BoS does a stellar job of capturing the Buick’s attitude and elegance from the perfect metallic light blue paint job to the massive chrome front bumper and grille and equally large rear bumper that wraps clear around to the rear wheels. The headlight bevels and finned taillight hoods also are chromed as are the wiper arms. Four chrome Ventiports on each front fender are nicely shaped and there’s more chrome for the door knobs, mirror and rear tailgate window’s handle. BoS opts for painted silver trim around the windows and along the nine roof ribs that add to the wagon’s swept look and looks fine in a display setting. 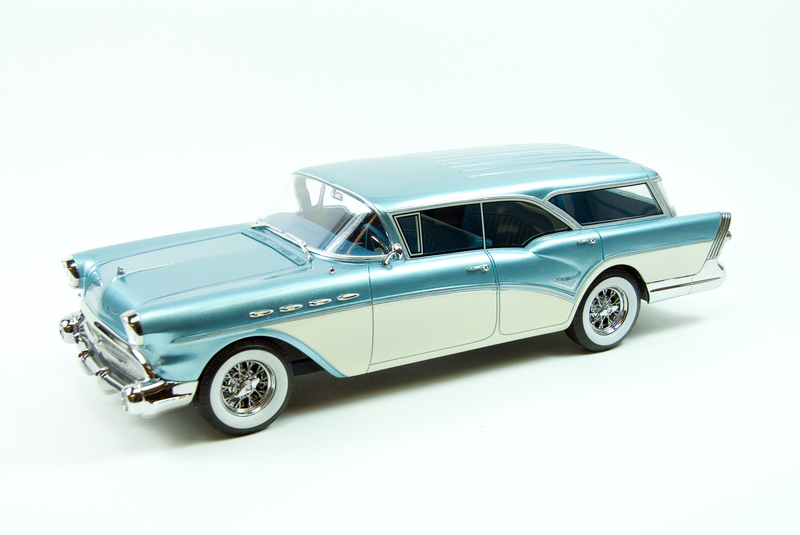 Headlights and big red taillights are realistic looking and BoS delivers a fine photo-etched Buick name on the nose of the hood, plus a script “Caballero” on the rear side doors along script “Estate Wagon” on the tailgate. Even the trim streaks down the car’s sides are photo-etched. The interior is a slightly darker shade of blue and all one color, no two-tone here, although some of the original models did have two-tone interiors. The steering wheel is blue with a full chrome horn ring. The dash includes radio, speedometer and clock graphics that look realistic through the sealed cockpit. You can also see the large round pointy air vents that resemble jets and that are being used again in car interiors of late. You also can view door handles and window cranks on each interior door surface, plus the chrome-look gas and brake pedals. BoS wheels are especially nice, wire wheels with large Buick logo spinners that look custom, but were standard on some models at the time. Further detail includes a blue and yellow Pennsylvania license plate front and rear. The car’s bottom is flat with no detailing. Exterior detail is what the BoS Buick is all about and it delivers that well beyond the asking price.